Politicians who deny climate change: Red state districts most at risk from global warming. The people who deny climate change are most likely to suffer from it. Great Plains and Corn Belt constituents should reconsider their stance on climate change if they want to avoid conditions that hark back to the Dust Bowl. Yuma, Colorado, a farming town of 3,500 people near the Kansas border, celebrated last month as homegrown Republican Cory Gardner was elected to the U.S. Senate. Gardner, a high school football player and the son of a farm equipment dealer, defeated incumbent Democratic Sen. Mark Udall to help the GOP gain control of the Senate in the second-most expensive congressional race of all time. Gardner represented Colorado’s 4th Congressional District for four years, an expansive territory that covers the mostly flat and rural eastern third of the state. Farmers there mostly grow corn to feed cattle, and water comes from the quickly depleting Ogallala Aquifer. Gardner ran for Senate as “a new kind of Republican.” That means he was bold enough to stand in front of a wind turbine and voice support for both renewable energy and natural gas. But Gardner, who leans toward the Tea Party, has also questioned whether people are causing climate change. His climate-skeptic position is ironic—and dangerous for his very constituents. Climate models project that Gardner’s current House district—along with much of the food-producing Great Plains and Corn Belt—will experience the country’s most drastic temperature and precipitation changes in the coming years. Gardner’s home turf, one of the 10 largest congressional districts in terms of agricultural area, will likely face a temperature increase of more than 8 degrees Fahrenheit and a more than 9 percent drop-off in precipitation by 2100—among the most extreme projections for the country. That’s according to analysis from a forthcoming peer-reviewed study in the journal Ecosphere by Brady Allred of the University of Montana and colleagues. Allred’s study looked at political representation, agricultural and natural-resources land cover, and projected climate disruptions across the nation’s 435 U.S. House districts. The researchers discovered that the districts with the most agriculture and natural resources are predominantly represented by Republicans who, like Gardner, generally deny the science of global warming. Those districts also likely face the most severe climate changes. The disconnect isn’t just depressing news for climate-conscious voters in other parts of the country. 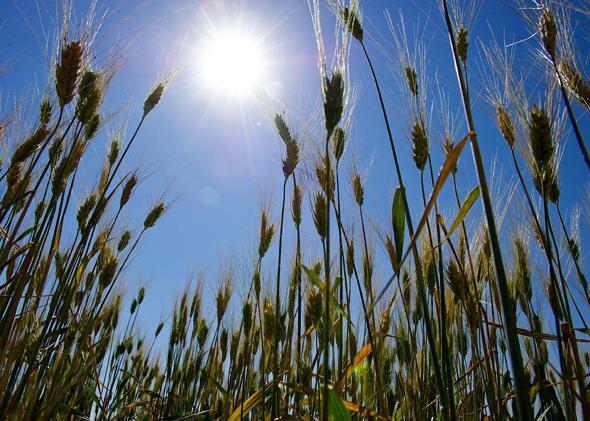 The failure to act on climate issues could devastate the nation’s breadbasket. Climate change could harm corn, soy, wheat, and cattle production, affecting U.S. and global food supplies. In other words, the effects of political polarization and Republican aversion to climate action could harm everyone. Climate change denial is now “something of a litmus test for Republican politicians to prove their conservative bona fides,” says Riley Dunlap, a sociologist at Oklahoma State University. Dunlap and colleagues recently published their own study in Nature Climate Change, which found that party affiliations are even politicizing how we perceive weather: Democrats were more likely than Republicans to report the exceptionally mild winter of 2012 as “warmer than usual.” And as Dunlap’s past research on the politics of climate change points out, people who oppose government climate action are more likely to hold misperceptions on the science. “The officials and public policymakers least predisposed to act on climate change actually live in the districts that will be most readily harmed,” Dunlap says of the Allred study. Of course, if politicians and voters don’t believe that global warming is occurring or that people are the cause, those looming consequences don’t offer much political traction. A 2013 poll found that 46 percent of Republican voters and 70 percent of Tea Party Republicans say there is no solid scientific evidence of global warming. Republican lawmakers and officials in rural states, such as Kansas, Oklahoma and Wyoming, have even fought against new science-education standards to teach climate change in schools. For Democrats, just 11 percent of voters deny climate science, making political affiliation one of the most predictable determining factors of a person’s view on the issue. That’s a lesson that NextGen Climate, former hedge fund manager Tom Steyer’s political committee, learned the hard—and expensive—way this fall. NextGen spent more than $65 million on key Senate and gubernatorial races, seeking to elevate climate change as a campaign issue. The efforts paid off in New Hampshire, where Sen. Jeanne Shaheen held her seat against challenger Scott Brown, and in Pennsylvania, where Democrat Tom Wolf won the governor’s race. But other results, including Gardner’s win in Colorado and Republican Sen.-elect Joni Ernst’s victory in Iowa, were discouraging outcomes. Despite his “new kind of Republican” claims, Gardner’s climate views are mostly the same old same old. Since 2010 he has waffled over whether people and fossil fuel emissions are the culprits behind global warming. This past January he was among House Republicans who blocked an amendment recognizing that carbon emissions from power plants and other sources are “contributing to long-lasting changes in our climate that can have a range of negative effects on human health and the environment.” During an October debate, he avoided giving a direct “yes” or “no” response to whether humans are contributing to climate change. Meanwhile, parts of his House district have faced drought conditions than rival those of the Dust Bowl, the sort of event predicted to increase as the planet heats up. Ernst also ducked on climate change this fall, saying during a debate, “I don’t know the science behind climate change,” a variation on the popular “I’m not a scientist” mantra being repeated by evidence-dodging Republicans. Her hometown of Red Oak sits within Iowa’s 3rd Congressional District. Based on Allred’s analysis, it’s the country’s 22nd-largest district by agricultural area and is projected to experience a roughly 9-degree temperature spike by 2100. That’s the largest modeled increase of any congressional district in the country, and an approaching disaster for Iowa’s farmers. With Republicans gaining control of the Senate, Congress is expected to push to approve the Keystone XL pipeline and fight off President Obama’s proposed rules to regulate power plants’ carbon emissions. Climate activists and scientists say a new pipeline or the failure to control coal and other fossil fuel pollution would undermine global efforts to slow warming trends. Obama’s energy policies are “too far left,” a Gardner campaign representative told the New York Times a few weeks before the election. But Obama’s policies are similar to Colorado’s all-of-the-above approach, which has encouraged new solar panels and wind turbines along with continued oil and gas drilling and coal mining. Of course, politically polarized Republicans use any issue as a metaphor for their distrust of the administration, regardless of the reality. The efforts of NextGen Climate may pay off in the future. Following a depressing election night when climate change clearly didn’t turn any races, the group’s strategists said they’ve laid the groundwork to make climate an important issue in 2016. Steyer still has plenty of money to spend, but then again, so do the Koch brothers. The long-term climate costs won’t be felt at the start of the 114th Congress in January. But climate models suggest that we’ll all feel the burn—and some of the most stubborn Republicans and their constituents will feel it worse than others.